Monster Hunter X will be the latest addition to the ever popular Monster Hunter franchise, which will be launching in Japan on November 28th. For those of you that are familiar with the series you won’t be surprised to learn that the Felyne’s will be getting a Wind Waker makeover. 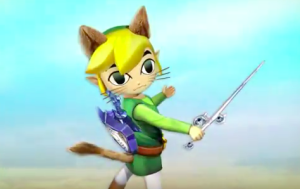 One of the many new costumes that will be made available for the furry little creatures will be a Link costume from The Wind Waker, the kitties will be able to don Link’s very own green tunic! The costume comes complete with Link’s trusty sword and shield, as well as the Wind Waker! Capcom has just uploaded a new trailer for the new costume, so jump on in past the break and check it out. Im not too sure how I feel about that costume… It looks a slight bit odd for the Felyne to be dresses as Link. The Monster Hunter series is not new to doing collaborations and has featured several costumes from The Legend of Zelda series in the past. I have honestly not always loved the crossover costumes, except for The Devil May Cry collaboration — that one was adorable! What are your thoughts? Do you like seeing these types of collaborations? Tell us your thoughts in the comments below.